At this stage the Bitcoin scaling debate is not about scaling. It's all about coffee. Many in the community just want their coffee and don't care if it's on-chain or off-chain. To highlight the severity of the debate, we'll start off by showing the dangers of showing your support for either side. Yours developer Ryan X. Charles risked his life when he publicly admitted to liking his coffee ON-CHAIN! For the rest of his life, the small block, off-chain coffee extremists may attack or DDOS him. Ryan, if you need protection please get in touch. We have prepared $100 million USD to kill off any attacking small-blockers. Back in 2015, Roger Ver made a 100% accurate tweet about coffee and the free market vs government programs. Apparently, this was at a time when Roger was still able to buy his coffee on-chain. He was not outraged about coffee at this point, but it was a sign of things to come. 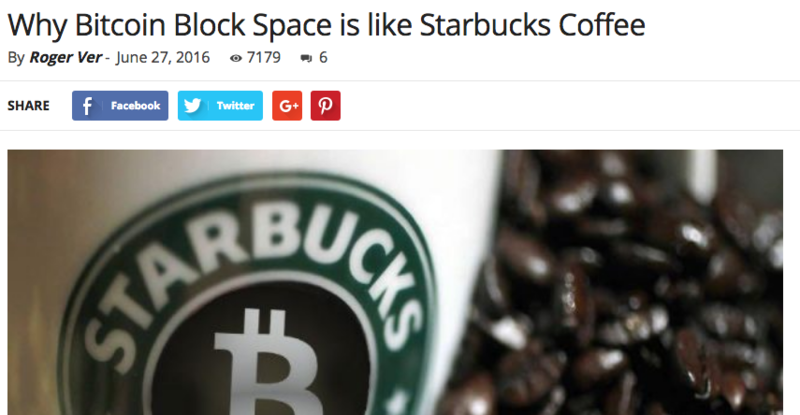 In June 2016, Roger made a post titled "Why Bitcoin Block Space is like Starbucks Coffee". Perhaps this line of thinking is what's driving his support for on-chain coffee solutions like Bitcoin Unlimited. Although most of the debate is about whether coffee should be purchased using on-chain or off-chain Bitcoin transactions, Roger is also now concerned over whether coffee purchases are defined as micro-transactions or not. "Buying a cup of coffee is not a micro transaction"
Satoshi's whitepaper is like the Bible in the Bitcoin Coffee Debate. We must follow it to a point. Satoshi never mentioned coffee in the whitepaper. This has left it up for debate whether or not Satoshi liked his coffee on-chain or off-chain. According to Charlie Shrem, Satoshi liked off-chain coffee! Do Prominent Bitcoin Figures Like Their Coffee On or Off-Chain? Litecoin creator Charlie Lee personally prefers his coffee on-chain, although it's not clear whether Charlie has ever taste tested off-chain coffee. @ShitcoinJesus Yes, you can! And coffee taste better when bought on-chain. If you want to buy coffee on-chain, activate #SegWit (tested, vetted, ready). There is no better scaling solution. Others are just theory. Like Charlie Shrem, Oleg Andreev has not made it clear whether he has tried both on-chain and off-chain coffee. But it looks like he's had an opinion in this coffee debate since 2014, when he claimed that, unfortunately, all coffee transactions may need to be off-chain. We'll need off-chain clearing network with IOUs protected by bilateral deposits on blockchain anyway — for micropayments and coffee. Well-respected cryptographer Nick Szabo has even weighed in on the debate. While not mentioned directly, it appears Szabo would also prefer his coffees off-chain. When buying a coffee, security is not a high priority. Do not store your savings on CoffeeChain(tm). Bruce Fenton used to think coffee was Bitcoin's killer app, but as of March 29, 2017 his opinion has changed. Yrs ago we had grand visions of everyone buying coffee w Bitcoin. Famous Twitter personality WhalePanda also believes Bitcoin coffee payments are meant to be off-chain. @edbwt Bitcoin is digital gold and store of value, it isn't made to buy your coffee with it. Value prop for #bitcoin is gold 2.0. Consumers aren't seeking alt currency transactions for coffee/sandwiches. BitPremier founder Alan Silbert also wants to see coffee transactions off-chain on Lightning. Alan, why haven't you listed premium coffee on BitPremier? It would be a bestseller! If I'm missing any more opinions on the coffee debate, please reach out to me on Twitter. Does On-Chain Coffee Even Exist? Since baristas are not embedded into the Bitcoin blockchain, an off-chain barista will ALWAYS be making your coffee. So, regardless, technically all coffees are still off-chain. According to Mandrik, User Ops Manager at Blockchain.info, off-chain coffee is better for the environment because it may push people to make coffee at home instead. Drinking coffee at home prevents the need to make both an on-chain or off-chain transaction. @keonne @fonebtc This is why off-chain coffee solutions are better. Make your coffee at home and re-use cups, people! Perhaps BlockstreamCore just wants it to be MUCH harder for people to buy coffee at all so less plastic and waste goes into landfills? Blockstream, the evil company that contributes more to Bitcoin development than any company, even formed an exclusive partnership to sell coffee ON-CHAIN to the world's 7 billion people. Remember this despite claims that Blockstream is trying to push all of the world's coffees off-chain. In one of the few things Blockstream and Roger Ver agree on, both REALLY like Starbucks coffee. Most mentions of coffee by both also include a reference to Starbucks. The reality is this debate doesn't need to happen, since Samson already agrees with Roger that Bitcoin Unlimited would be a GREAT way to buy coffee on-chain. Congrats to Keonne Rodriguez for making the most famous Bitcoin Coffee Debate tweet ever! It generated 314 retweets and 390 likes. Remarkably, he did not even have to use the word coffee but used the world latte instead! Bitcoin isn't about buying a latte with your mobile phone, it is about making the transactions that they say you can't make. During my research for this site, I believe I found the real Satoshi. Let's forget Dorian Nakamoto. If he was the real Satoshi he would have asked for free coffee instead of free lunch. We don't even need to mention Craig Wright. He would have proved he was Satoshi by buying an on-chain coffee with coins from the first block. This guy must be Satoshi. Since it's his name, and he LOVES coffee. Newsweek, please contact me and I can give you the full list of tweets. After the ASICBOOST controversy, Bitmain may need to come up with some sort of ASIC technology advantage to keep their dominance. Unfortunately, CoffeeBoost is already used online and likely can't be patented. If you want some damn coffee so bad, buy a coffee maker, and a damn bag of coffee. I've mostly tried to stay out of the scaling debate. But after buying coffee both on-chain and off-chain, the taste is the same. I just want to use my bitcoins to buy some damn coffee. This site is meant as a joke. We also take coffee very seriously and hope this debate resolved soon so we can get started drinking coffee again instead of talking about it.